Baseball is insanely popular in Korea. 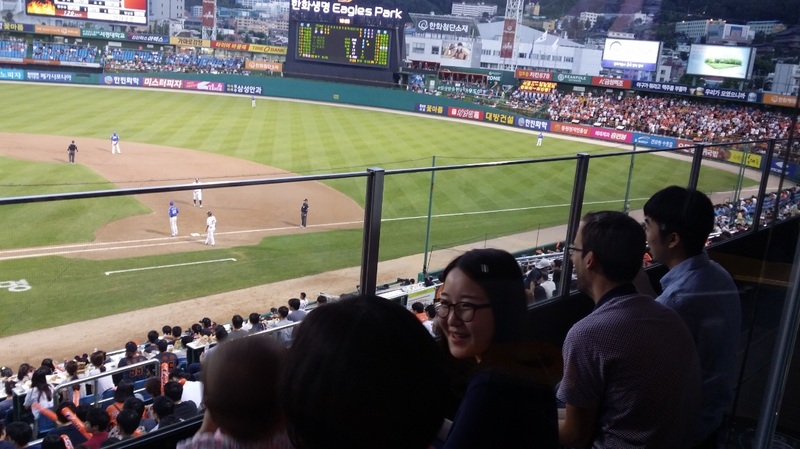 We were fortunate enough to score some tickets for a particular exciting game in the season (the local Hanwha Eagles #6 vs. the Samsung Lions #1). For a Dutchy this was all new for me and I have to say that I really liked the game vibe, atmosphere and food*. Suddenly we were approached for an interview right at the break of the fifth inning. I got a bit nervous when she mentioned it would be a live (but scripted) interview during break time. So there we were, taken backstage and up to the reporter areas. The 30 second interview was about our family and asked why we came to Korea (obviously for this particular game), and what dutch people think about Korean baseball. Ofcourse we also did a little cheer for the local team. 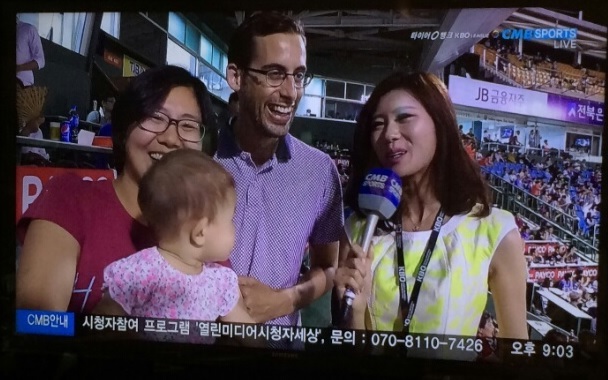 So I’m a proud father of a eight month old daughter who made an appearance on Korean tv! After a bad start of the match Hanwa (#6 in competition) actually beat the #1 in the competition; The stadium exploded with cheer. We got a signed baseball too! All and all: We had a great day! *Koreans shout ‘FIGHTING!’ to cheer someone or a team on. In terms of food, Chimek is great at sports events; CHIcken and MEKchu (beer); Basically KFC style crispy chicken with hot sauce and a cold beverage, what a combo! Cool experience! Do you think you can get the video of your interview as well?